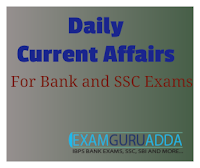 Dear Readers, we are presenting Daily Current Affairs for All Exams- 1st December 2016. 1. The Competition Commission (CCI) in the last week of November 2016 approved the merger of Bharatiya Mahila Bank Ltd (BMBL) with the country's largest lender State Bank of India (SBI). 2. The combination is in the form of amalgamation whereby the business of BMBL, including its assets and liabilities, will be acquired by SBI. While SBI has global presence, including offices in 37 countries, BMBL is a nascent bank set up in November 2013. 1. NITI Aayog, under the banner of the Union Government, on 30 November 2016 constituted a 13-member committee to promote cashless economy. The committee will be headed by Andhra Pradesh CM Chandrababu Naidu. 2. The committee will be formed by Chief Ministers of various states representing different political parties to examine and promote the use of digital payment systems across the country. 1. Magnus Carlsen won the 2016 World Chess Championship on 30 November 2016 in New York City, USA. 2. Carlsen defeated Sergey Karjakin to retain the World Chess Champion title. It’s the third time that Carlsen has won the championship. He has reigned as world champion since 2013. 1. The Supreme Court ordered status quo on land acquired for the construction of the Sutlej-Yamuna Link (SYL) canal’s stretch in Punjab. 2. Moreover, the court also appointed Union Home Secretary, Chief Secretary of Punjab and the Director General of Punjab Police as receivers in the dispute between Punjab and Haryana and sought a report from them by 15 December on the present status of land. 3. A bench comprising Justice Pinaki Chandra Ghose and Justice Amitava Roy also made it clear that receivers cannot take over the possession of the land meant for the SYL canal project. They have been appointed only for the purpose of submitting a report on the ground situation. 2. According to SC such practice, will instil a feeling of committed patriotism and nationalism. It should be seen as an opportunity for the public to express their “love for the motherland.” The SC order was given by bench of Justices Dipak Misra and Amitava Roy on a writ petition by Shyam Narayan Chouksey in October 2016. 1. India has signed government-to-government (G2G) deal with the United States (US) to buy 145 M-777 Ultra-Light Howitzers worth $750 million under the Foreign Military Sales programme. The deal was signed at the two-day meeting of the 15th India-US Military Cooperation Group (MCG) held in New Delhi. 2. This is the first defence deal signed by India for purchasing artillery guns since the Bofors scandal in 1980s. It was recently cleared by the Cabinet Committee on Security (CCS) headed by Prime Minister Narendra Modi.